Handmade from palladium, this eternity ring features seven 2mm princess cut G-H VS1-2 diamonds, totalling 0.35ct. 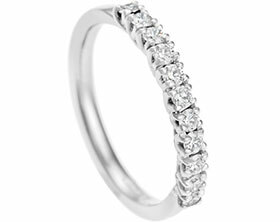 The diamonds have been invisibly set across the front of the band with equal spacing between each of the beautiful stones. The contemporary shape of the princess cut diamond is complemented by a band with a crisp flat profile which gives the eternity ring a very clean and modern look. A polished finish completes this classic design.